CNC Maintenance Training Assessment Equipment (Real Object, with Siemens System). The CNC system adopts Siemens 802S series and a biaxial linkage. The main axis frequency conversion control adopts a three-phase hybrid stepping driving system. The system consists of an intelligent assessment system, CNC training bench and physical CNC lathe. 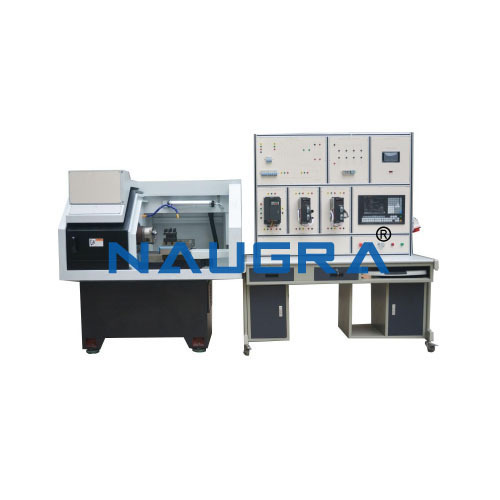 It not only can act as maintenance training system of CNC lathes electrical wiring, but also as an actual processing device. The system has an electrical fault and maintenance assessment function. The assessment system uses DLWW-GX2.0 system assessment methods, it uses dynamic database link technology, and it can link student information.